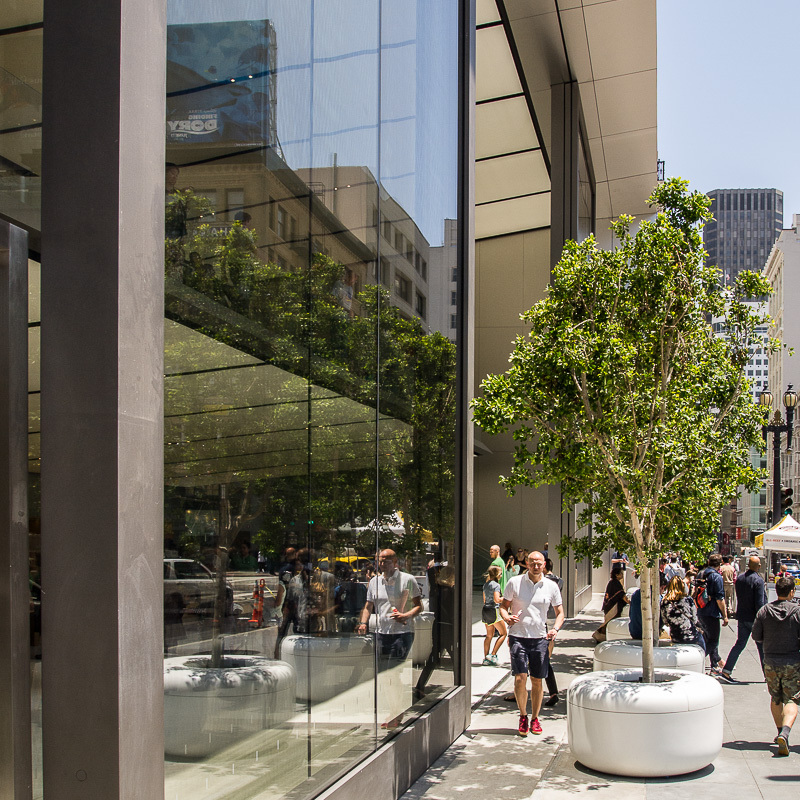 We visited the new Apple Store on Union Square in San Francisco just a few days after it opened. It wasn't a press tour, though, so we saw the glass and metal building actually at work. And it gave us something to think about. Apple Union Square. Looking northwest at Post and Stockton. We'd just come from Saks Fifth Avenue up the street. Retail outlets are struggling and Saks is no exception. We seemed to be the only people in there and, properly speaking, we weren't customers. 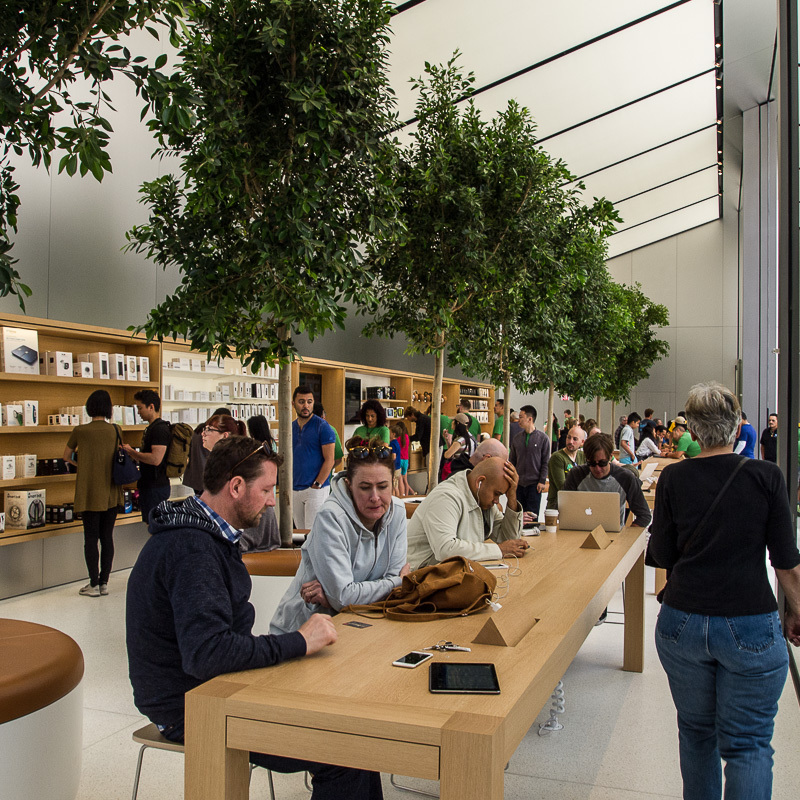 Retail outlets are struggling because, if you know what you want (and who doesn't? ), you can find it online cheaper and with less hassle (like parking). 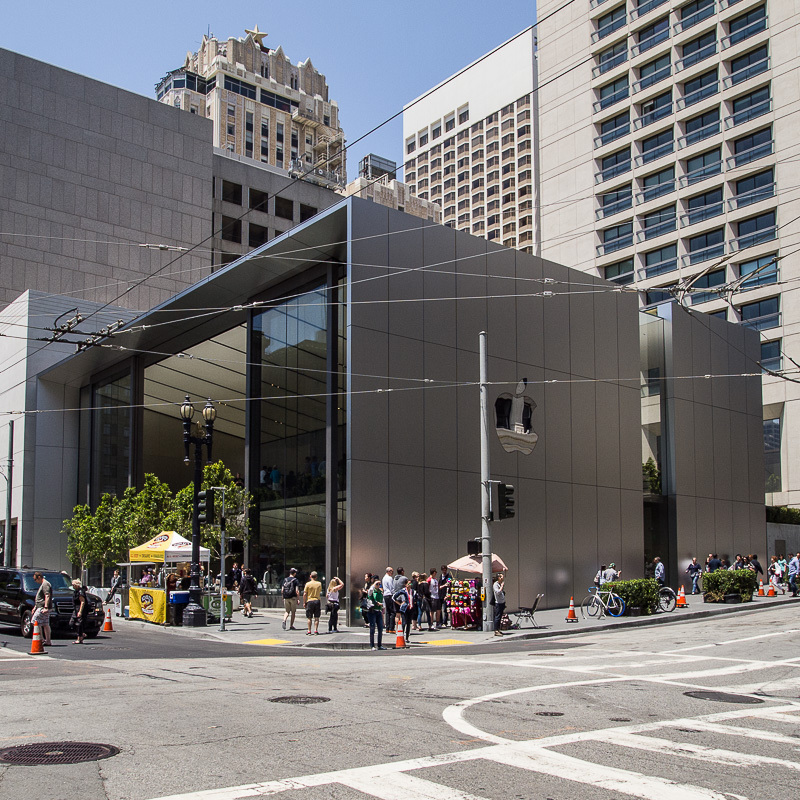 And yet the Apple Store was mobbed. And not with people like us, admiring the building. 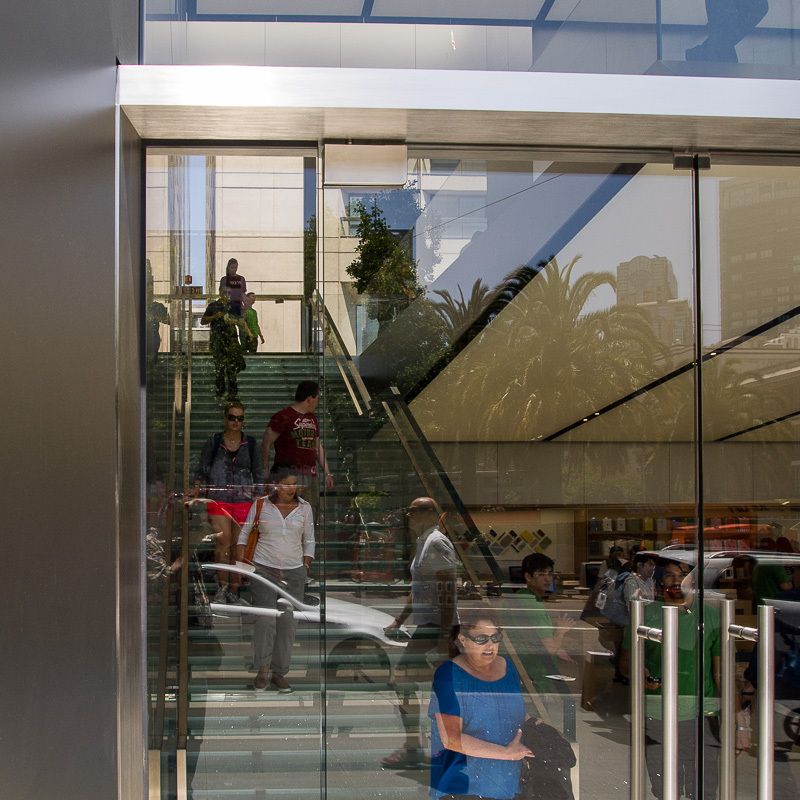 They were admiring iMacs, iPhones and iWatches just like at any other Apple Store. The place wasn't just full of customers though. It was about evenly divided (perhaps by design) between customers and staff. You could tell them apart by the green T-shirts staff wore. 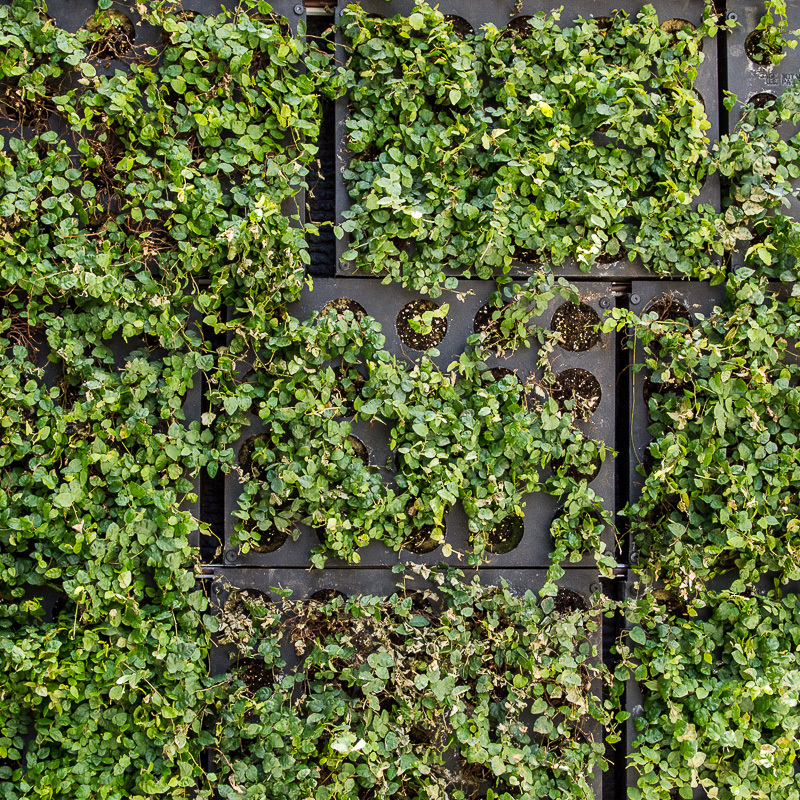 Green is a theme at the place. 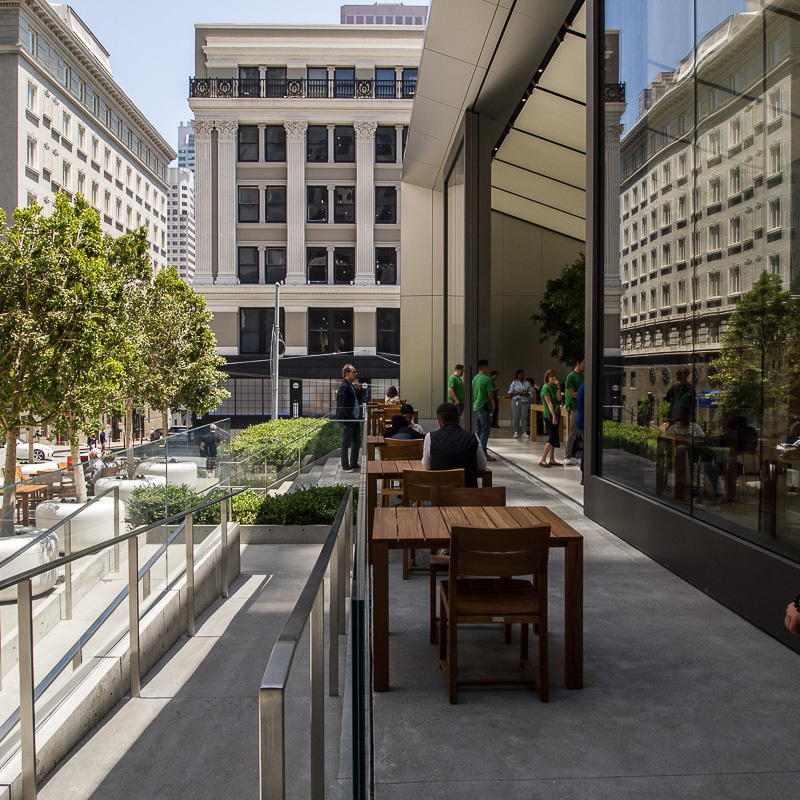 The 42-foot sliding glass doors (huge pocket doors, both front and back) let in a lot of sunlight, a good thing for the living trees in the Genius Grove on the second floor. 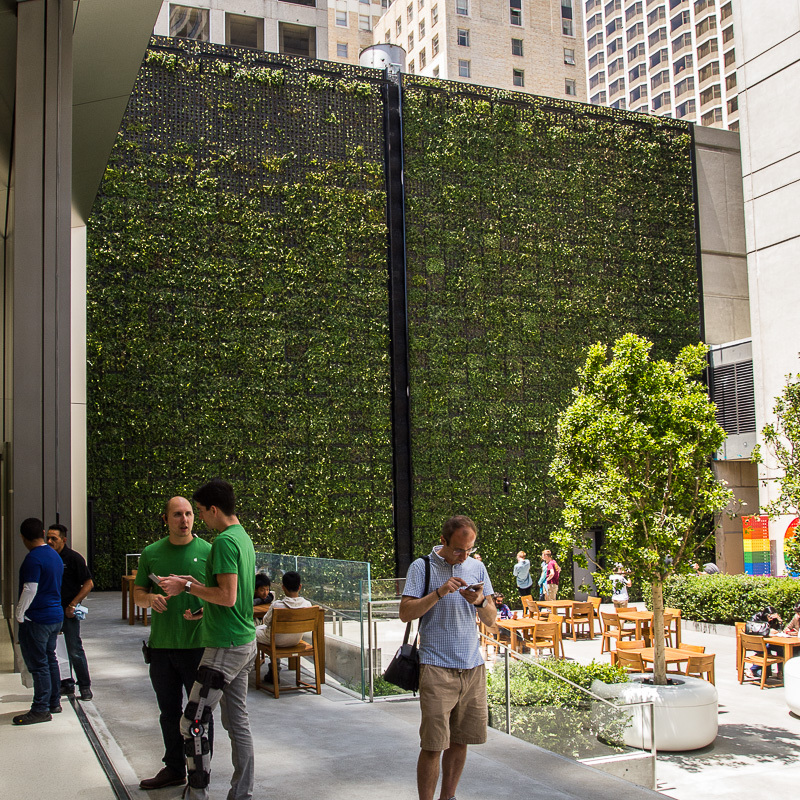 A 50-foot living wall borders the outdoor Forum in the back, whose street entrance is graced by Ruth Asawa's San Francisco Fountain. We hinted that there were intentionally as many staff as customers. 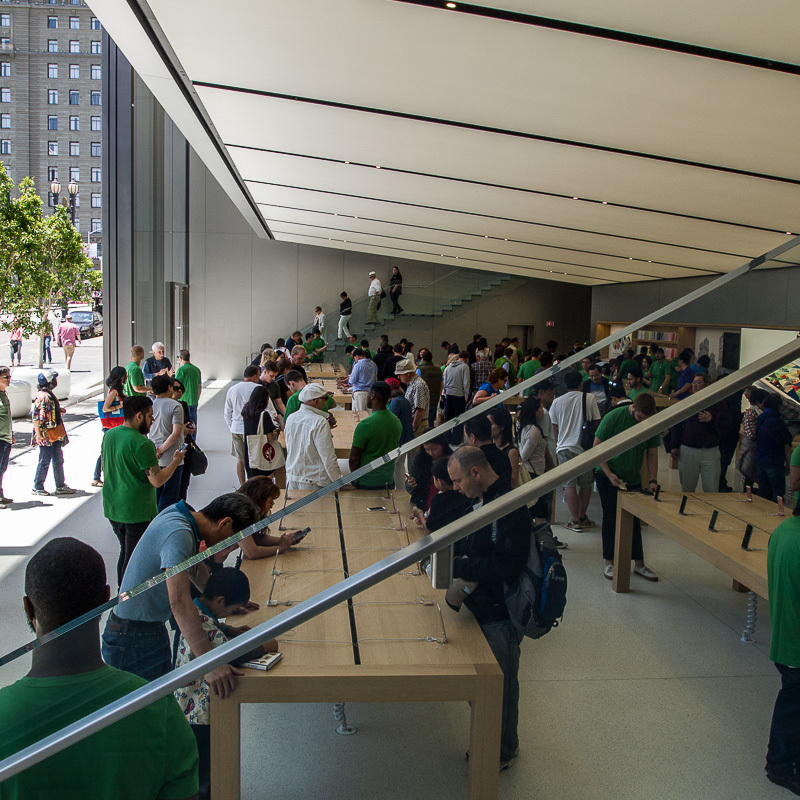 Apple Stores certainly do have plenty of staff. But with such an open design, we almost felt escorted. We were only in there eight minutes (according to our capture times) and were greeted by three separate employees. Each of which was unfailing polite in asking if we had any questions and perfectly content to let us wander around unescorted. Given the open design, we took this to be partly a security measure. 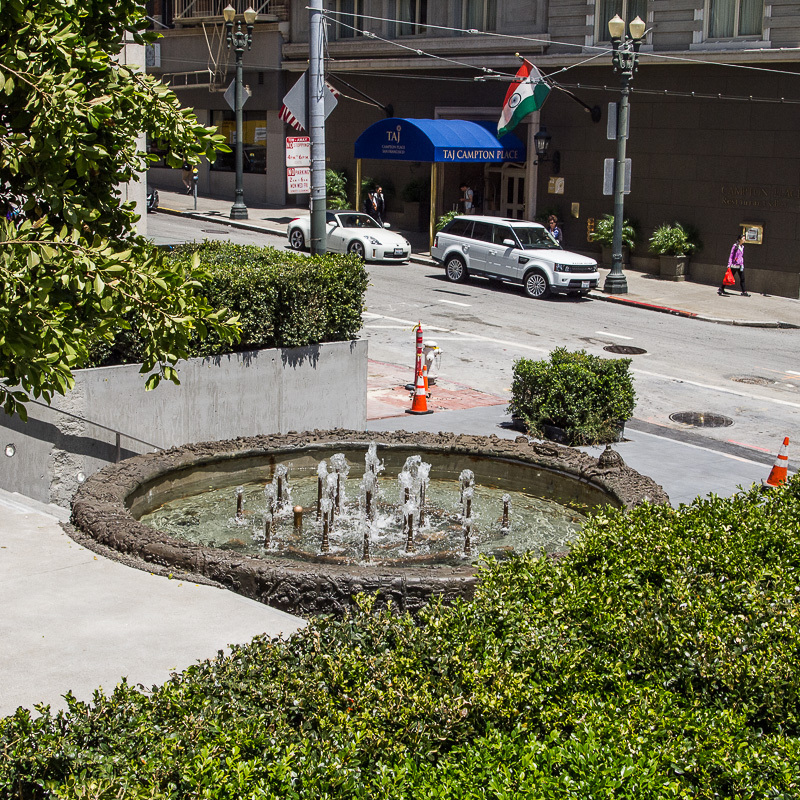 The city is notorious for its non-voting population, though there was little evidence of it at Union Square. 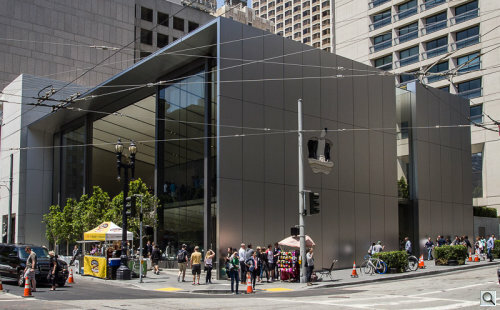 Still, given the situation, it was bold of Apple to build a place that opens huge windows to the world in the front and invites its visitors to sit in the back. 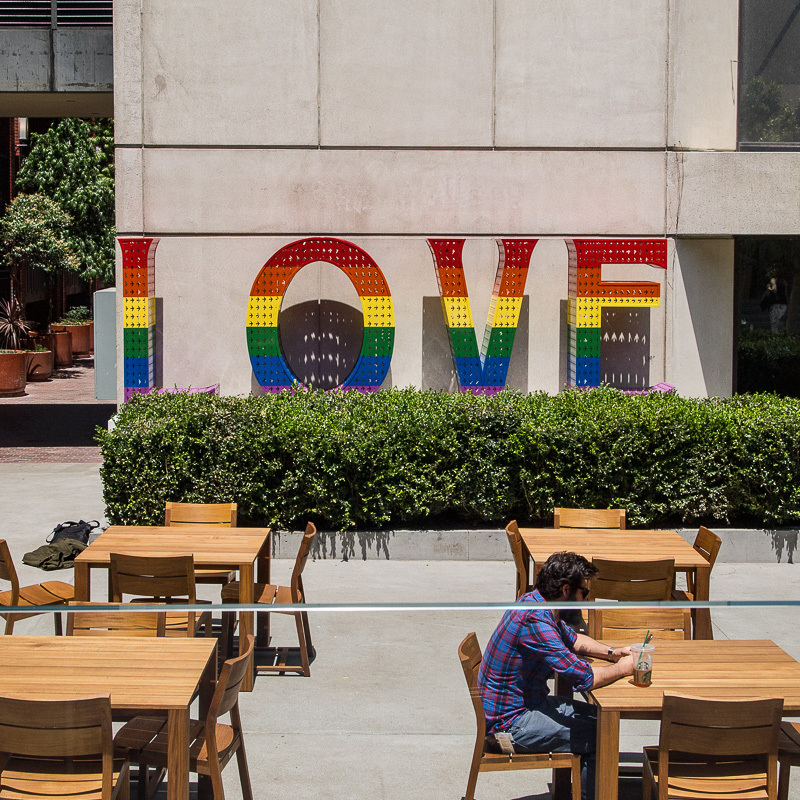 Apple's Chief Design Officer Jonathan Ive described the design as "breaking down barriers and making it more egalitarian and accessible." Indeed. 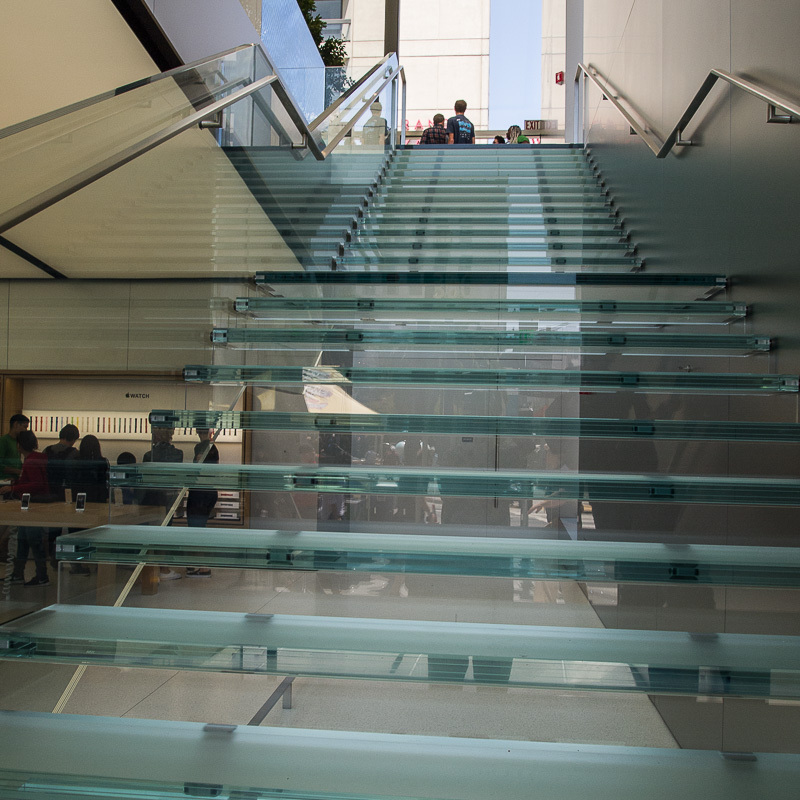 In eight minutes we didn't make it to the top, suspended floor of the building but our shots walk you through the entrance, the product displays, one of the glass staircases, the Genius Grove and the forum to the fountain. We shot everything with a small mirrorless camera and processed the DNG Raw files in Lightroom CC. This time, though, we spent a lot of time with the Upright tool. The building demanded we straighten our horizon and fix converging verticals. And we think you'll see the difference in our straightened images compared to what's been published online from the press preview. Many of the images attest to the open design with their bright sunlight patches competing with shadowy interiors for good exposures. That's really not something you can do much about in the camera (especially a smartphone camera). But because we had shot Raw, not JPEG, we had some latitude that we really needed. Then interiors, for the most part, were the story so the exposure was optimized for them but we were able to recover the bright outside scenes by pulling that Highlight slider far to the left. We captured a view of the store (which opens the slide show) after we'd left and cross the street. The shiny Apple logo caught our eye. Just as it was meant to do.